1. I've decided that fly fishing on the flats is always windy. You know those pictures of a slick as glass flat you see in the magazines? They don't exist. Wind is tough, but it covers up mistakes so learn to live with it and you'll catch more fish. 2. You might be saying, "Man this guy sure griped a lot about the wind on his last trip." See, it wasn't just me who said it was windy. Little windy out there, dog. 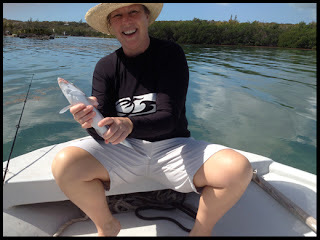 Last week I had the good fortune to participate in writer’s week at the Long Island Bonefish Lodge. The lodge is located at Deadman’s Cay in the center of Long Island which is located due north of Guantanamo Bay, Cuba and just south of Andros Island. The island itself is about 80 miles long but only four miles at its widest point. The week brought together eight different writers including reps from The Drake, Midcurrent, Field and Stream, Trout Unlimited, Salty Shores, the Angling Report, and DIY Flats Fishing. A BIG THANK YOU to our host, Nevin “Pinky” Knowles, brother Leo and sister Darlene (Darlene, I still think about those conch fritters you brought out every day at 5:00). Getting to Long Island from the East Coast is fairly easy. I live in Washington, D.C. and took a direct flight from Reagan to Nassau. Then it was a quick flight on a local Bahamian airline to Deadman’s Cay. I left DCA at 8:30 and landed in paradise by 2:00 PM. I flew Pineapple Air and it worked great. Southern Air and Bahamas Air also service Deadmans. The Long Island Bonefish Lodge is a whole new bonefishing experience that I think those who have some experience under their belt would enjoy. 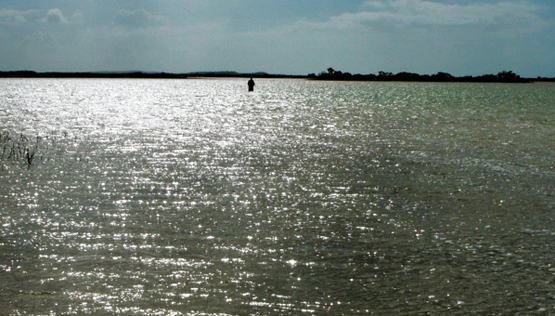 The lodge itself is located on what must be a hundred square miles of pristine bonefish flats. It consists of three duplex style cottages that can hold eight anglers. The main lodge is where you eat and stock up on Kalik at the end of the day. The fishing is assisted Do-It-Yourself. Pinky has three brand new Mitzi Skiffs that take anglers out to productive flats. The guide will drop the anglers and point them in the right direction where they wade and hunt fish. Each group has a radio in case the flat is not productive or you have a problem. You might wade for two hours or four. The boat then meets you for lunch and takes you to another flat to coincide with tidal changes. Mitzi skiff's ready to take you fishing. To be sure, this isn’t a place to take your first bonefish trip. Seeing fish, learning how they react to a fly, and how to fight a bonefish are critical skills you need to have before any type of adventure like this. However, once you feel like you can sight fish yourself, this is a great way to save some money as the prices are a lot less than a traditional lodge experience. The great thing about this lodge is that it takes a lot of guesswork out of traditional DIY. While I can hold my own seeing fish and casting and landing them, understanding the tides on a flat is still really tough for me. I understand the concepts, but unless you’re there all the time it’s tricky. It’s also difficult to get to productive flats unless you have a boat. Long Island Bonefishing Lodge solves these problems by putting the “assist” in DIY. In addition to the flats at Deadman’s Cay, the lodge has several protected spots within driving distance that Pinky can transport you too. They have kayaks, too, that are well suited for anglers to move around on the flats and to wind your way through the mangrove jungles to skinny water where the bonefish live. Finally, they offer a more traditional experience of fishing from the boat for an additional charge. The lodge itself is a great place. The rooms are not only very clean, they are very comfortable, spacious, and well made. The food? Well, I honestly haven’t eaten that well in a long time. Pinky does the cooking and served up grouper, lobster, hog snapper, and lots of conch. And everyday at about 4:30 or 5 the conch fritters pour out of the kitchen. It’s really a thing of beauty. Lunch is made to order and you eat on the boat. Breakfast is a hearty egg, bacon, or sausage affair with coffee being served beginning at 6:30. If you need a bonefish fix and want a great Out Island experience, there is no better place to head than the Long Island Bonefish Club. If you go, tell Pinky The Bonefish Flat sent you. And ask Darlene to send me some conch fritters. note: The trip report will follow, but I wanted to get a lodge review out first. I've been working on this trip from Long Island, Bahamas, but I'm not quite done. I should have it ready for you tomorrow so you can take a Friday work break to check it out. In the meantime, enjoy this photo from flats. The sun is going down on the flat's at Deadman's Cay. During writer’s week at Long Island Bonefishing Club, I had the chance to spend some time with The Drake editor Tom Bie and he was kind enough to sit down and do an interview with me. In my opinion, The Drake is hand’s down the best fly fishing magazine available today. If you have been fly fishing for any length of time, your magazine interests will eventually graduate to The Drake. A lot of magazines focus on the how to. The Drake assumes you're comfortable with a double haul or a slack line cast and instead of telling you where to go fish or how to fish, it focuses on good writing and top notch storytelling. There's a lot to admire about Tom. It becomes clear quickly that the guy loves to fish. His passion for fly fishing is truly genuine. I had a great time talking to him about fly fishing in general and about some of the places he’s travelled to and some of the things he’s done. Tom has earned his stripes in the fly fishing world. He started out as a fly fishing guide, began writing in smaller publications, and eventually started The Drake and built it into what we all love today. The next issue has been finished and I was psyched to get a sneak preview. Tom is really in-tune with the fly fishing “world” and one thing I learned from him is how truly small that world is. For example, did you know that Tom officiated the wedding of Travis Rummel (of Felt Sole Media fame) and his wife Melissa at R.A. Beattie’s ranch? Without going into too many details, he's was very candid with me about the ups and downs of the fly fishing business. The whole conversation was a fascinating learning experience for me. The last few interviews on the Bonefish Flat have allowed me to talk to some people I really admire. Tom Bie was no exception and this interview did not disappoint. When you started The Drake, did you envision it as mainly focused on trout fishing or more of an all inclusive fly fishing magazine (meaning saltwater, too)? I didn’t envision it lasting this long. I really didn’t have a five year plan. I looked at it as a local publication to start with. I do think we do a good job of covering saltwater fly fishing. Maybe 60-40? What’s your favorite saltwater destination? Where are you headed next? Ascension Bay. I like the variety of species available. The quality of the guides and the ease of access make it a great destination. After I leave here I’m headed up to Grand Bahamas for more bonefishing. Who are some of the people you look up to in the fly fishing world? David James Duncan. Tom McGuane. The Felt Sole Guys. David James Duncan, Monte Burke, McGuane, Ted Leeson, John Larison, Kirk Deeter. I know you are heavily involved in the F3T Festival. What are some of your favorite films? The Felt Sole guys are putting out amazing stuff. I also think that the guys from AEG had more talent than people gave them credit for. Dave Teper for his creative and technical knowledge. R.A. Beattie has really been a pioneer at the age of 23-24. I would also say Dave Teper and Will Benson, both together and separately are doing some great stuff. 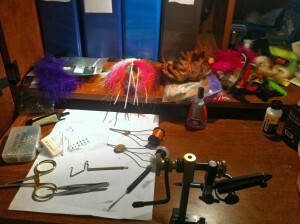 Who are the up and coming guys in the world of saltwater fly fishing? Both writers and fisherman. There are a lot of guys in Florida to look out for. Will Benson, Drew Delashmitt, and David Mangum. In Louisiana look out for Bryan Carter. I’d also say Seth Vernon in North Carolina is doing some really cool stuff. Are all good writers big boozers? With a sly grin on his face, he thought about this one for a minute. I would say no, but there is an obvious connection. What will The Drake look like in 10 years? We are going to be more active digitally. I like print, but for me it’s all about the quality of the writing. If you think about it, Twitter didn’t even exist five years ago so things are changing fast. I’d like to think that The Drake is just getting started. Do you read a lot of books and magazines outside of fly fishing? I read the other magazines to check out the competition, but I mostly read things outside of the fly fishing world. I go to bed every night reading the New Yorker. I think pound for pound they have some of the most in depth and well written pieces out there. For business news I read Fast Company. I read Wired because I like their take on technology. You’re fishing Long Island for bonefish and the wind is blowing 30 mph all week. Would you pick up a spinning rod? A big thank you to Tom for his willingness to sit down with me. Hopefully our path’s will cross again someday and we can fish together again. I'll try to put up a few posts this week. I'm off and on my way to writer's week at the Long Island Bonefish Lodge. It should be a great week of bonefishing. I'm at the airport now en route to Nassau. Apparently it is spring break so, in a strange twist of events, I'm actually raising the median age of the passengers on this flight by what 15 years. Stay tuned for some posts this week!